Hotel in the Kiev region of Simferopol. 7 rooms. Rate from 1800 to 3000 USD. Decsription: The hotel is located 800 meters from the Kuibyshev Square on the same street Lermontov. It features: a cafe on the first floor, the rooms of 4 categories, Wi-Fi internet access, laundry and shuttle services. Hotel in the center of the city. Offers for honeymooners. Decsription: The hotel is located in the center of Simferopol. Rooms The 14 comfortable rooms 5 categories. The hotel has a conference hall, near many cafes and restaurants. Decsription: Private mini-hotel is located in the central area of Simferopol. All rooms are decorated in soft colors and furnished with comfortable furniture, equipped with plasma TVs. Hotel guests around the clock with free Wi-Fi. Private bathrooms with complimentary bath amenities. At the reception, guests can buy toiletries. Hot and cold water. Simple things Hotel is located in the center of Simferopol, and offers standard rooms, deluxe double value from 3200 to 6000 rubles per day. Decsription: Simple things Hotel is located in the center of Simferopol, and offers standard rooms, deluxe double value from 3200 to 6000 rubles per day. The hotel is located in the center of Simferopol. 19 rooms. Decsription: Marakand hotel is located in the historic center of Simferopol. It offers 19 rooms, a cafe-bar Eastern cuisine, two conference rooms and Eastern hospitality. Each room has a minibar, hydromassage box, TV, telephone with international access and air conditioning. Otel raspolozhen far from delovoho and cultural center of the city. Guests predlahayutsya komfortnыe and its contemporary rooms raznoe categories by dostupnoy price. The apartments there conditioner, refrigerator, TVs and vannaya be dropped. 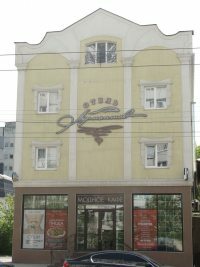 Hotel Prague 500 m. From the railway station of Simferopol. Hotels offers Comfort category Double Standard (2-3 persons), Suite. Decsription: Hotel Prague 500 m. From the railway station of Simferopol. Hotels offers Comfort category Double Standard (2-3 persons), Suite. Brigantine Hotel is located two kilometers from the city of Simferopol in the 10-minute drive from the city center. Hotels offers rooms Class Standard, Superior, Standard, Studio and costs from 1200 to 2500 rubles per day. Decsription: Brigantine Hotel is located two kilometers from the city of Simferopol in the 10-minute drive from the city center. Hotels offers rooms Class Standard, Superior, Standard, Studio and costs from 1200 to 2500 rubles per day. Hotel Lakkiraspolozhena in Simferopol, 300 meters from the banks of the river Salgir offers rooms class economy, standard, economy, standard, junior suites cost from 1800 to 4100 rubles per day. Decsription: Hotel Lakkiraspolozhena in Simferopol, 300 meters from the banks of the river Salgir offers rooms class economy, standard, economy, standard, junior suites cost from 1800 to 4100 rubles per day. Decsription: Vena Hotel consists of nine comfortable hotel rooms made in classical style of standard level and equipped with everything necessary for good rest. Our new Vena Restaurant offers a huge hall of 350 square meters for 200 seats and exquisite aristocratic interior. Classical European cuisine and courses made by our chef will leave no one indifferent.